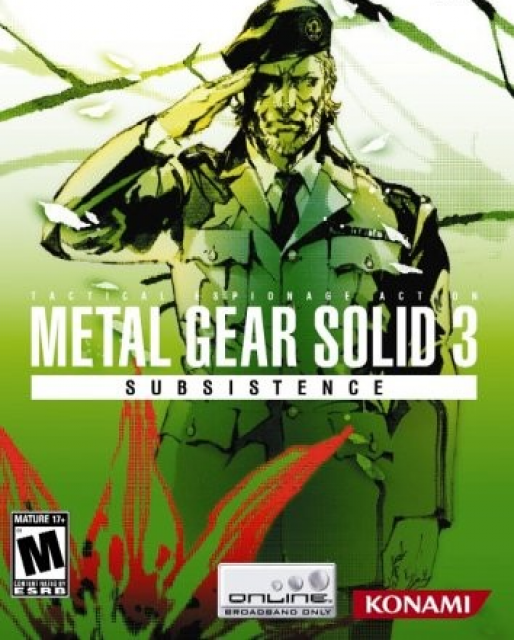 Subsistence is an updated version of Metal Gear Solid 3: Snake Eater which contains several new features, most notably a third-person camera and an online mode, Metal Gear Online. It is extremely hard to find in Europe, as Subsistence in EU is the US Subsistence Limited Edition by default. For an in-depth look at the story and gameplay, see the Metal Gear Solid 3: Snake Eater page. This page contains information about the new features included in this release. Subsistence added a number of features not included in the original MGS3. It was the first Metal Gear to map camera control to the right analog stick, arguably improving the gameplay. It also included the first online multiplayer component in the series, though it has since been taken off-line. The original release of the game also included ports of the original MSX versions of Metal Gear and Metal Gear 2: Solid Snake, marking the first time these games were made available to fans outside Japan. There were some other bonus features included as well, including parodies of several cut-scenes found in the game. Due to the added content and the improved camera, Subsistence is objectively superior to the original, featuring the same superb storyline and characters while making the game-play more enjoyable. Subsistence was also re-released as part of the Metal Gear Solid: The Essential Collection just prior to the launch of Metal Gear Solid 4: Guns of the Patriots. However, this version did not include the second or third disc and therefore lacked some of the bonus content the original release contained. It was also included in the Metal Gear Solid HD Collection. It features 1080p support, run at 60fps, Transfarring support, and trophy support. While of course it doesn't have a second disc, it contains Metal Gear and Metal Gear 2. Online multiplayer featuring Deathmatch, Team Deathmatch, Sneaking mission, Capture Mission and Rescue Mission. Complete Metal Gear Solid 3 Snake Eater game with new user controlled 3D camera. Includes never-before-released games: Metal Gear and Metal Gear 2 Solid Snake. Game connectivity with Metal Gear Acid 2 on PSP. Special bonus disc Existence featuring new re-cut cinematic scenes from MGS3 and the MGS4 trailer shown at Tokyo Game Show 2005 (exclusive to the limited edition.